Most people think of acne as a normal part of adolescence, just one of the many hormonal tricks the teenage body likes to play on us. It’s often chalked up to greasy skin or bad hygiene, as though acne sufferers could cure all their problems just by washing their faces. But acne isn’t just an adolescent problem: around a quarter of adult men and half of adult women suffer from it. And it isn’t caused by dirty skin, either – beauty might only be skin deep, but acne goes much deeper. In part it’s genetic, but in recent years more and more scientists have also discovered a link between acne and diet. Before the early 2000s, the standard clinical opinion was that acne and diet were completely unrelated: acne was a bacterial infection, or a genetic trait. Some studies even attempted to explain it as an evolutionary adaptation, to ward off prospective mates until the acne sufferer was more physically mature. But since many people suffer acne well into their 20s (when their ability to raise a baby is greatest) and even beyond, this is a less than satisfying explanation. Dr. Loren Cordain’s research into non-western lifestyles gives us the first clue that acne is not just Mother Nature trying to make sure teenagers don’t have babies before they stop listening to Justin Bieber. Cordain studied two hunter-gatherer societies, the Kitavans and the Ache, and found that none of them had acne. The genetic differences between groups of humans aren’t significant enough to explain this, so diet, lifestyle, or a combination of the two must have at least something to do with the problem. The research into diet and acne is still in its infancy, since dermatologists have only been seriously studying it for a few years and many still believe that the two are unrelated. But the evidence we have seems to point to several foods as potential acne triggers, and may help to explain why acne often improves so dramatically on a Paleo diet. Everyone’s skin is covered with hair follicles, even on places where you don’t notice them (the only exceptions are the palms of your hands and the soles of your feet). In people with healthy skin, these follicles produce a kind of oil called sebum, which keeps your hair and skin soft and bendable. Think of that healthy, shiny glow of really beautiful hair – that’s sebum in action. 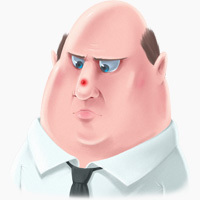 Acne sufferers tend to produce too much sebum (giving them “greasy skin” no matter how often they wash it). This is generally understood to be hormonal; it’s related to the production of the hormone androgen, which peaks in puberty in both men and women. These hormonal changes are why women’s acne patterns often change with pregnancy, menstruation, and PCOS: they change the rate of sebum production. Excess sebum isn’t the only reason why acne forms – it also has to do with the skin cells themselves. In people with healthy skin, the skin cells in the follicles are constantly changing. The body regularly makes new skin cells and sheds the old ones (a process called desquamation). In people with acne, the skin cells don’t desquamate properly because these people have too much of a protein called keratin. This prevents the old skin cells from leaving the follicle, and clumps them together around it, trapping the sebum inside. The result is a plugged-up hair follicle full of sebum (a micromedo), home sweet home to a species of bacteria called P. acnes. In people with normal skin, P. acnes is a commensal species that doesn’t cause any damage, but when it colonizes the clogged follicle, it causes redness and inflammation, and countless ruined high school proms. Clearly, acne isn’t just a disease of needing to wash your face: no amount of soap will reduce a genetic propensity towards creating too much keratin, or the hormonal changes that trigger the production of extra sebum. And the Kitavans and the Ache certainly weren’t mainlining Proactiv to keep their skin healthy. So what acne-causing factors aren’t present in hunter-gatherer societies? What might be different about the Kitavans and the Ache that prevents them from breaking out? An interesting connection between diet and acne from the Paleo point of view is the link to insulin and insulin resistance, brought on in the diet by eating too many carbohydrates with a high glycemic load. Glycemic load is basically a measure of how much a certain food will increase the level of insulin in the blood. It’s based on a measurement called the glycemic index, which measures how much a gram carbohydrates in a given food increases blood sugar, relative to a gram of pure glucose. The difference between glycemic index (GI)and glycemic load (GL) is that GL takes into account the total carb content of the food. Some foods have very high GI carbohydrates, but not a lot of them. Thus, they don’t actually raise insulin much in total. Increased insulin is androgenic (it increases the production of androgen), and since higher levels of androgen increase sebum production, it’s plausible that higher GL foods might trigger breakouts by raising insulin levels in the blood. A diet very high in GL foods would eventually cause insulin resistance, elevating blood insulin levels even further. Thus, it’s entirely possible that high-GL foods do contribute to acne. Giving some support to this theory, Cordain’s studies of hunter-gatherer societies with no acne found that the diets of these groups had a low glycemic load (even among the Kitavans, who ate quite a lot of starch). In contrast, the Western industrial diet is based on high-GL foods like bread and white potatoes. This suggests glycemic load as one potential link between the modern diet and acne rates. Interested in testing this correlation, a group of researchers in Korea performed a study to test the effectiveness of a low-GL diet for treating acne. The results were impressive: the low-GL group showed a significant improvement in their acne after a 10-week intervention period. The authors acknowledged that errors introduced by self-reporting of food intake might have limited their study, but even so, their work provides substantial support for the idea that a high glycemic load in the diet might trigger acne. A fascinating dietary link between acne, insulin, and a specific food is the connection with dairy. Many teenagers have already made this connection on their own, but after studying the role of milk in the development of acne, one group of researchers proposed a potential reason that connects milk and dairy products to the overall role of high GL carbohydrates in the development of acne. They found that the high glycemic load of milk increases the levels of an enzyme called mTORC1, which helps to regulate how the body handles insulin and leucine (a milk protein). The gist of these studies is that milk may be particularly bad for acne not only because lactose causes the same insulin-androgen response as other high-GL carbs, but also because one of the proteins in milk is easily converted by that same hormonal pathway into fat in the sebaceous glands. On top of these problems, milk also contains hormones from the cows themselves that amplify the insulin response. In support of the theory that milk might lead to acne breakouts, one study found that Malaysian teenagers who had acne tended to also have a higher consumption of milk and ice cream (although interestingly, not yogurt or cheese, dairy products lower in lactose), and a diet with a higher GL. This doesn’t necessarily prove that drinking milk causes acne – correlation doesn’t imply causation. The study was done remotely, by subjects who kept food diaries and then sent them in, so there might be other factors at play that the researchers didn’t know about. But it is an interesting start to the research, and hopefully clinical trials will soon be able to confirm or deny the link with more certainty. In women specifically, certain diagnosed hormonal disorders also involve the production of excess androgens and the resulting acne problems. The most common of these, Polycystic Ovary Syndrome (PCOS) is also strongly associated with insulin resistance, which provides a further link connecting insulin resistance to acne. PCOS is marked by hormonal imbalances, specifically the production of too much androgen. This causes an enormous variety of problems, including ovarian cysts and irregular periods. Another symptom is adult acne: women with PCOS have a much higher rate of acne than the overall population. The majority of women suffering from PCOS also struggle with insulin resistance and weight gain. Both antiandrogenic drugs and insulin sensitizers appear to be useful in treating acne in these women, suggesting that PCOS-related acne, excess androgen, and insulin resistance are all related. From all of these related factors (PCOS, dairy, and the role of high-GL carbohydrates), it’s clear that the connection between acne and insulin can manifest itself in many different ways. But since Paleo, like the diet of the Kitavans and the Ache, promotes insulin sensitivity, all of these different problems support the idea that Paleo can help treat acne by reducing the insulin response. Glycemic load is one obvious difference between the Kitavan and the modern American diets, but since the diets of hunter-gatherer societies are different from the diets of modern teenagers in so many ways, it’s absolutely possible that some of these other differences also contribute to acne formation. In fact, this is more than likely, considering that low-GL diets improved, but did not completely eliminate, acne in the test subjects. It’s probable that the low-GL diets removed one factor in the Western diet that promoted acne, but left subjects still suffering from others. Since acne is marked by inflammation, another aspect of the Western diet that could contribute is the high prevalence of inflammatory PUFAs, and the imbalance between O6 and O3 PUFAs. In a traditional diet, the ratio of O6:O3 is between 4:1 and 1:1, while in the modern Western diet, thanks to the high consumption of seed oils and industrial fats, the ratio hovers closer to10:1. It makes sense that more balanced levels of O6 and O3 would tend to reduce acne-related inflammation as part of a decrease in the overall inflammatory burden in the body. Although the evidence for this is nowhere near conclusive, several studies have demonstrated that people who eat more fish (the main dietary source of O3 fats) are less likely to develop acne, and fish oil supplements show some promise for treating acne patients. Other studies may also shed some light on this hypothesis. In one study, acne patients had higher intake of chicken and pork compared to their healthy peers, who had higher intakes of fish. The researchers blamed a “high fat diet” for the difference, but it’s also very possible that the O6:O3 ratio had something to do with it. Chicken and pork are both quite high in O6, while fish and seafood are high in O3. This study was an epidemiological survey (namely, a study based on asking people what they ate and whether they had symptoms, not a controlled laboratory experiment), so it’s insufficient to prove causation, but it does give an interesting piece of evidence. In another study, researchers gave fish oil supplements to 13 healthy young men, with mixed results: 8 of the patients improved, 4 got worse, and 1 stayed the same. Since the subjects who showed improvement all started out with moderate to severe acne, the researchers speculated that fish oil might only be beneficial in these cases, and not for very mild acne. However, this study also includes another potential variable that the researchers didn’t mention, namely how the subjects treated their fish oil. This is significant, because even O3 PUFA is still PUFA. Keeping fish oil out at room temperature causes the fats to go rancid very easily, while keeping it in the fridge would preserve the structure of the fats. Thus, it’s possible that differences in the way the study subjects treated their fish oil could lead to the differences in results. Of course, fish contains a lot of nutrients besides Omega-3s, and it’s also plausible that fish oil studies meet with mixed results because they aren’t including everything that makes whole fish so beneficial. Acne patients also have lower levels of selenium and zinc, two very important micronutrients found in seafood, and experimental supplementation shows that this might be a promising direction for research. Another extremely important micronutrient found in seafood, iodine has quite a complicated relationship with acne. Iodine is found in fish and seafood (which were associated with lower rates of acne), but also in kelp and seaweed (associated with breakouts). Some people also suspect that the iodine in milk may be one reason why dairy and acne are so closely related. The relationship between milk consumption and iodine overdose is not clearly supported – there is iodine in milk, but probably not enough to cause serious problems. It’s more likely that milk and acne are connected though insulin and androgen production. The difference between fish and seaweed might be for the same reason. Fish is a dietary source of iodine, but the iodine in seaweed and kelp is much more concentrated, so it’s easier to get too much. The RDI of iodine for a healthy teenager or adult is 150 mcg, but some kinds of kelp have around 8,000 mcg per gram. Considering that the average serving of seaweed snacks is much more than 1 gram, it’s easy to see how eating seaweed could bring on an iodine overload. The reason why high doses of iodine are linked to acne may go back to the hormones involved, specifically the thyroid. The relationship between iodine and thyroid health is complicated – iodine can help healthy people, but too much of it can actually make an existing thyroid problem worse. Since the thyroid is such an important regulator of your hormonal system, it’s easy to see how thyroid dysfunction might affect production of androgens. Autoimmune thyroid disorder has been associated with adult acne, and it’s also associated with PCOS, so there are several possible ways that all these problems could be related through the same hormonal dysfunctions. Yet another connection between the industrial diet and skin conditions might be disturbances in the gut flora. Patients with acne show signs of gut dysfunction like leaky gut and Small Intestinal Bacterial Overgrowth (SIBO), as well as changes in the normal bacterial population of the gut. Since these gut issues are all inflammatory conditions, it’s possible that they contribute to acne in much the same way that an O6:O3 imbalance does, by causing systemic inflammation. The gut flora connection also suggests a reason for the link between acne and mental health, a link obvious to every teenage who consistently beaks out during finals week. It’s commonly known that stress is a serious acne trigger, but acne is also associated with depression and other mood disorders. The gut response to stress may be the missing piece of this puzzle: chronic stress (or other mood disorders) disrupts healthy patterns of gut flora colonization, and the resulting inflammation contributes to the development of acne. The idea that stress could change the patterns of gut bacteria seems strange on the surface, but the importance of the “gut-brain axis” is understood even in conventional medicine. Increasingly acknowledged as the “second brain,” the gut plays an astonishingly large role in regulating mood and mental health. The intensive communication between the enteric nervous system (the “gut brain”) and the central nervous system (the “head brain”) means that anything happening in your gut will affect you mental health, and vice versa. This is why functional gut disorders like IBS are so strongly associated with anxiety and depression, and may also be why stress can trigger breakouts. 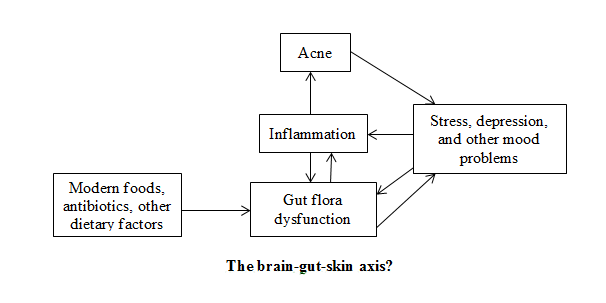 An additional piece of evidence for this “brain-gut-skin axis” is that many of the supplements discussed for acne in the studies above, like selenium, zinc, and Omega-3s, are also well-known for their mental health benefits as well as being tentatively suggested for acne treatment. It’s possible that by improving mood, they contribute to gut health and thus reduce the inflammatory response, taking that particular finger off the acne trigger. Excess sebum production: since a Paleo diet has a much lower glycemic load than the standard Western diet, it reduces the production of insulin. Paleo also eliminates milk, which is associated with a strong insulin response. Lowering insulin levels lowers the production of androgens, the hormones that increase sebum. Inflammation: by balancing levels of O3 and O6 fats, Paleo decreases the body’s overall inflammatory burden, reducing the inflammatory response that causes the redness and swelling around the irritated hair follicles. Healing the gut may also help improve acne symptoms by reducing inflammation. It’s possible that Paleo helps so many people with their acne by affecting just these two factors in acne development, and it’s also more than likely that there are other factors we haven’t discovered yet. But the evidence we do have suggests that a strictly dairy-free Paleo diet with a moderate amount of low-GL carbohydrates, and without excess consumption of seaweed or other foods high in iodine, is the best nutritional approach to help minimize this painful and embarrassing problem.